Great news! The state legislature finally passed a Capital Budget on January 18, 2018, including full funding to save the core of Blanchard State Forest from logging. The iconic trails, forests and habitat around Oyster Dome, Lilly Lake and Samish Overlook will now be preserved for future generations! While a few minor details still need to be worked out regarding the Trust Land Transfer exchange, plans are in place to do so through the Supplemental Capital Budget and the Washington State Department of Natural Resources. We’ll share more information as it becomes available, but look forward to a celebration on Blanchard Mountain later this year! THANK YOU to all the legislators, organizations, recreationists and community members who helped make this success possible! The new conservation area has also been officially renamed the Harriet Spanel Forest in recognition of one of its greatest champions, a longtime state senator who passed away in 2016. Hikers enjoy the trail to Oyster Dome on Blanchard State Forest. Photo: Anna Hogenson. Located south of Bellingham off Chuckanut Drive and home to Oyster Dome, Blanchard Mountain, Lily Lake and other beloved local outdoor destinations, Blanchard State Forest is a hugely popular recreation area visited by as many as 100,000 people from across the Puget Sound region each year. These state lands are managed by the Washington State Department of Natural Resources (DNR). Since the mid-2000s, we’ve been a leader in efforts to conserve this special place. Scroll down for the full history of our work. In 2007, we helped craft the Blanchard Forest Strategy agreement, identifying a 1,600-acre core zone that would be protected for recreation and environmental qualities and would no longer be logged for state trust lands beneficiaries. However, to implement the Strategy DNR needed funding to purchase replacement timberlands to offset those in the core zone. From 2015 through 2018, we worked with elected leaders and partners including Skagit Land Trust and local recreation groups to ensure the remaining funding is provided and the fiscal needs of the Blanchard Forest Strategy agreement are fulfilled. The state passed a Capital Budget in January 2018 that includes full funding to preserve the Blanchard core as a new conservation area! The ultimate of green belts, Blanchard State Forest is a beloved and well-used place for recreation, respite, and exploration that separates the increasingly populated Skagit and Whatcom counties. According to DNR data, more than 100,000 people visit Blanchard’s 4,800 acres each year to ride horses, hang glide, hike, mountain bike and watch birds and other wildlife. Oyster Creek has a native run of salmon and sea run cutthroat trout. Blanchard State Forest features popular hikes (including Oyster Dome and Blanchard Mountain) and mountain bike trails; scenic lakes and streams; salmon, trout, owls and woodpeckers; deer; mushrooms; and territorial views west to the San Juan Islands and east to Mount Baker and the Cascades. Patches of remnant old growth and stately, mature trees remain after nearly three generations of logging. Blanchard State Forest also provides important habitat connectivity as the only place in Washington where the Cascade Mountains meet the Salish Sea. The southernmost outpost of the Chuckanut Mountains, Blanchard Mountain, together with the Lake Whatcom watershed, helps connect the coast to the Cascades. Blanchard State Forest is one of many valuable state trust lands–working forests managed by the state Department of Natural Resources (DNR) for state trust land beneficiaries. State plans to log the entire Blanchard State Forest were met with great concern in the 2000s. In 2006, the agency convened a group of diverse interests, including Conservation Northwest and Friends of Blanchard Mountain, to create a management plan for Blanchard’s forests that could satisfy the needs of all with interests at stake. In late 2007, with support from the DNR and Commissioner of Public Lands, the group announced the Blanchard Forest Strategy agreement. The agreement was signed in January 2007. This collaborative agreement recommended that a 1,600 acre core area be protected. This core protects most of the recreational resources such as the top of Blanchard including the Oyster Dome, trails, and lakes. However, to implement this part of the Strategy DNR needed funding to purchase replacement lands for the core zone. This will sustain the working land base for generating revenue for the Burlington-Edison School District and other specific trusts. The other two thirds of Blanchard State Forest will remain working forest. The Public Land Commissioner accepted the recommendations and the Washington State Legislature showed their support over the course of three legislative sessions by initially providing $5.5 million of the $12 million in appropriations necessary to fund the replacement land purchases. A decade ago, the chair of the Mount Baker Group of the Sierra Club, Randy Walcott, took up the cause of protecting Blanchard State Forest and Blanchard Mountain from ongoing logging. In December 1998, he formally petitioned the DNR requesting that Blanchard Mountain be declared a natural resource conservation area. The agency denied the petition, citing loyalties to the trust. 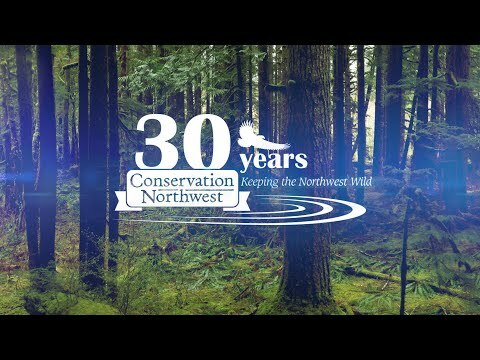 In 2001, Conservation Northwest joined Randy and others to protect Blanchard State Forest. Conservation Northwest’s goal was twofold, safeguarding Blanchard in perpetuity as a functioning forest and leading a way to better management of our other valuable state trust lands. In 2006, to break a long stalemate, the DNR convened a group of diverse interests, including representatives from Conservation Northwest and Friends of Blanchard Mountain, to create a collaborative forest management plan for Blanchard’s forests. It was an opportunity for the Board of Natural Resources and DNR staff to work with citizens finding a proactive solution to protect this remarkable mountain and its forested trails and wildlife habitat. In late 2006, this collaboration produced the Blanchard Forest Strategy agreement, protecting 1,600 acres of core, central habitat from logging while allowing continued logging on other parts of the forest under prevailing rules. That heart of Blanchard is 1,300 acres more than the DNR wanted to give up and 1,000 acres less than what conservationists had been fighting for. But the Blanchard agreement made up for that by finding unexpected common ground around the idea of working together to prevent the conversion of working forests to sprawl. The agreement was signed in January 2007. In 2010, Commissioner of Public Lands Peter Goldmark announced that the Department of Natural Resources intends to establish a Natural Resource Conservation Area (NRCA) at the core of Blanchard State Forest. NRCA designation protects “outstanding examples of native ecosystems, habitat for endangered, threatened and sensitive plants and animals, and scenic landscapes. In 2016, the State Legislature has previously supported the Blanchard agreement with $6.5 million in funding; however, an additional $7.7 million was needed to complete the purchases of core zone replacement lands. Without this funding, the Strategy is no longer implementable. DNR committed to implementing the Strategy but is unable to do so without the remaining $7.7 million from the legislature. In 2017, after passionate advocacy in Olympia from our organization and numerous other recreation and conservation leaders, funds to preserve the Blanchard core were included in both the state House and Senate budget proposals during the 2017 legislative session. Frustratingly, the Capital Budget was stalled due to disagreement over unrelated issues, and the legislature adjourned without passing it. In 2018, the state passed a Capital Budget in January 2018 that includes full funding to preserve the Blanchard core! The new conservation area has also been officially renamed the Harriet Spanel Forest in recognition of one of its greatest champions, a longtime state senator who passed away in 2016.